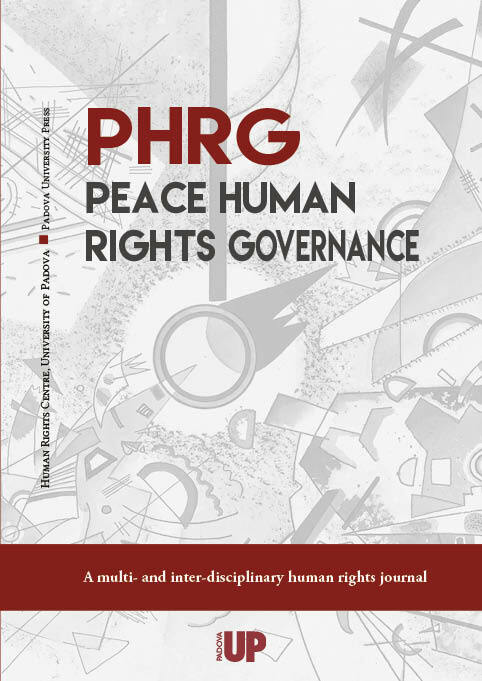 PHRG constitutes a new scientific resource within the increasing and multi-faceted global human rights studies community that aims to present original contributions, both theoretical, methodological and empirical, to current human rights and international relations issues while actively favouring the development of a solid multi- and inter-disciplinary and multi-level approach to peace and human rights research and dissemination. Launched during the year of the 35th anniversary of the establishment of the University of Padova Human Rights Centre (founded in 1982 by Antonio Papisca), PHRG is the latest expression of the long-standing scientific expertise of this Centre, which has included Pace Diritti dell’Uomo, Diritti dei popoli, Padova: Liviano and Cleup (1987-1996); and Pace diritti umani – Peace Human Rights, Venice: Marsilio (2004-2013), the Italian Yearbook of Human Rights series, Brussels: Peter Lang (2011- ongoing), and the editing of the Human Rights Studies Series, Brussels: Peter Lang (2011- ongoing). PHRG is framed within a solid and complete human rights higher education programme at the University of Padova, which comprises the 3-year BA in Political Science, International Relations and Human Rights, the 2-year MA in Human Rights and Multi-level Governance, and the International Ph.D Programme – jointly awarded by the University of Padova (coordinator), the University of Zagreb, Western Sydney University and the University of Nicosia – in Human Rights, Society and Multi-level Governance. PHRG has been included in the Anvur's list of scientifc journals for areas 12 and 14. PHRG editors make an initial quality screening process before selecting articles for refereeing. The papers judged to be of insufficient general interest or inappropriate are rejected without formal review, although these decisions may be based on informal advice by external experts. Articles passing the screening process will be sent out for peer review. PHRG editors aim to reach a first decision on all articles within 4 weeks from the submission. If the article is considered appropriate the Author(s) will receive an email notification from the Managing Editor in 4 weeks, that informs of a target editorial decision date. The usual time from manuscript selection to the author’s receipt of the PHRG’s decision about publication is 10 weeks. During that time each manuscript undergoes a rigorous double blind review by at least 2 independent expert reviewers. The possible outcome decisions are a) accepted; b) accepted with minor revisions; c) revise and resubmit (major substantive revisions required and the manuscript must be resubmitted for full review with no guarantee of acceptance); d) reject. PHRG will keep authors informed of the projected date of publication. PHRG provides immediate open access to its contents on the principle that making research freely available to the public supports a greater global exchange of knowledge. There is no submission or publication fee.